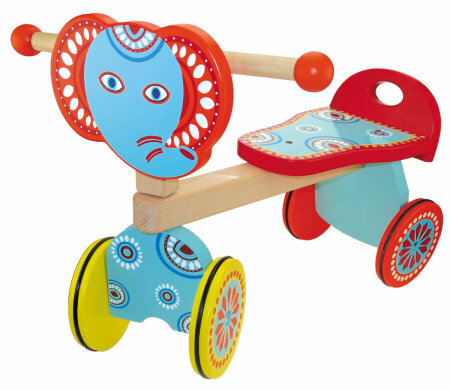 Wooden Toy Ride On Elephant is a beautiful made first ride on toy for your little one. This well designed fantastically colourful toy is made from high quality wood and has rubber inlaid wheels for safe quiet operation on hard floors. This toy requires simple assembly and comes in a 39.5cm long x 18.5cm wide x 24 cm high box. Size: Assembled 46cm long x 36cm wide x 40cm high. We like this because:"fantastic design a very unique looking ride on."